As my closest friends will know, I’ve been having growing up pains about Udai. All of nine, he has been in a broody, sensitive, rebellious frame of mind for the past few weeks. With holiday time meaning a complete lack of structure, it has not been easy to steer him into spending small amounts of time doing things that are not always appealing- in particular, written work and music practice have been a challenge. We have always tried to let our kids be, or that has been the intention at least. We’ve taken care to put them in a school that lets them be as well. And it’s been a rewarding experience for the most part. But as Udai moves toward middle school and I see him reluctant to rise to challenges, I do worry. I have no benchmarks for comparison; we all went to conventional schools and grew up in homes where discipline was a big part of our lives and questioning authority not acceptable. Of course we did our share of rebellion, but perhaps I have forgotten about my own experience of the confused state that entails being a pre-teen! The thing is: How do you explain that process of growing to love something that initially seems imposed, to a 9-yr old? I talk about my own experiences as examples, but I see in his eyes an unwillingness to engage with what I say and also a sheer inability to imagine a future that spans several decades! Added to this is the fact that Udai has high expectations of himself, but has not yet developed a mechanism for him to be able to accept criticism in any constructive fashion. His defense for performing a task shoddily, therefore, is the I-am-not-good-enough sort of pseudo self-battering that could, if left unchecked or allowed to grow, turn into lingering low self-esteem. I do realize that even very well meaning parents can burden their children by constantly voicing their expectations and that this can make for that child growing into an adult who is constantly seeking approval and struggling to gain confidence. In theory, I would rather Udai grows up to be an average student who is happy and follows his passions, but in reality I, like any other parent, long for him to excel and achieve what I think is his potential. The disparity between these two constructs is enormous and it isn’t practical to think one while practicing another, I know. I am venting on my blog my sheer guilt after this morning’s battle (regular feature now), and I have encouraged Udai to vent his feelings as well. Check out what he wrote! Now we sit relatively at peace, each of one of us, Aadyaa included, on our own separate devices , immersed in our work. I know I need to back off, calm down and I will get to it. For now, we battle and lock horns and that’s how we move a few steps ahead! Posted on June 23, 2013, in Personal and tagged parenting, pre-teen, self-esteem. Bookmark the permalink. 15 Comments. He is going through a phase, I think. gently touch subject of him being unhappy. 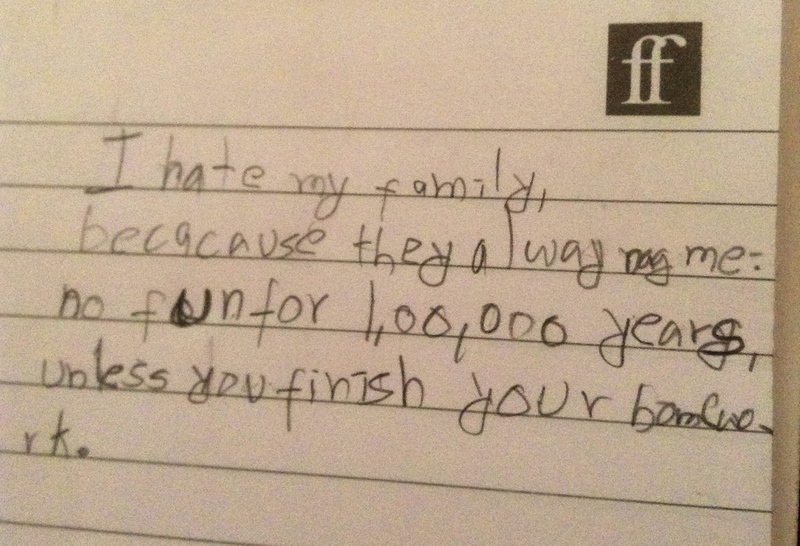 Yes, the words of “I hate you” from the child. I consider it a measure of successful parenting. I am there to be the Mom, not the friend. I allow the words because the anger must be vented and I encourage them to speak their mind. And Mom is usually the safest place for them to start. I don’t know about success, but it helped him vent. And taught him that mom can take the negative feedback without getting upset. That is a huge achievement. Muksi- that write up from Udai is priceless! Love it- and so absolute that sense of time- 100,000 years 🙂 As parents we all do this juggling act, on one leg, on a tightrope, constantly assessing and reassessing our actions, and needless to say we stumble and fall a million times. Its good to know that we’re not alone. Thanks for posting! He sat there staring at the blank sheet of paper till I nudged him and asked him to write what he felt without worrying about consequences. Told him I used to keep a diary and wrote things that my parents never saw. That sparked a glint in his eye and started writing. Friends have reacted with disbelief about the use of the word hate, but I am glad he came out with it. It’s so natural at that age to think the world of grown ups is against you. And to have a younger sibling who hogs all the attention just adds salt to his wounds. Glad you read, liked. How was the budday? I deal with full teen behaviour from an yet to be 8 year old and I am familiar with the phrase “Mom is BAD” and “I hate you”…the new one is “I hate you being pregnant” (I do admit that nowadays I have a little less patience, a little more tiredness by the end of the day and a little more snap in my temper). But I never minded these from Sanaa – it was her way of protesting the discipline I impose. I believe in discipline – not the “you gotta do the best in class”, but the need for a routine, need to pick up after yourself, clean up your own room, make your own bed, do your own set of chores around the house types. Our battlegrounds are these, or food timings (she is a SLOOOOW eater) or just general lack of show of respect to elders. Unlike the average Indian parent, I have always allowed her to speak her mind, but it has risen to a point now where at times she is downright rude and its become very important for me to make her understand that there are limits she cannot cross when interacting with people, especially adults. And yes, sometimes “do it because I say so” needs to be resorted to with a child who thinks she can make all her own rules – for everything. There are many mornings when I feel the way you do Mukta – that may be I need to back off, may be I am stressing too much – where did the cool mom I wanted to be go? But when I move away I know I am doing my best – which is all that we as parents can do. I allow my child to have an opinion, but she does NOT know all that is good for her. That is my job, however unpleasant it is. Being a parent is not a popularity contest – which I tell her in as many words – that “I AM BAAD”, and though sometimes in my insecurity (she loves me less everyday 😦 – how can you love someone who is behind you every day for everything you hate doing? ), I feel – oh it does not matter if I let her be – she will be happier (with me), I know that is not my job. And we make up by long sessions of cuddling up and talking before bed time, or when she comes (still) to have her finger kissed where it hurt her, (because mom’s kiss takes the pain away), or when she tells me that she needs me when she is disturbed about something because I calm her down. We call it a truce and move on, knowing that you disagreements with your parents is not temporary (I have had it all my life, growing up in a family encouraged to speak up), its lifelong, but it means in no way that the bonds are weak, or people grow up distanced or traumatised because of these battles. They are part of healthy well adjusted people’s lives – people who are not afraid to voice differences and who learn to navigate feelings through disagreements – something I feel a lot of people around me dont know how to. absolutely. i agree. disagreements are a part of life. i am shy of confrontation myself, have learnt to overcome it quite a bit, but i guess it’s still there which is why the run-ins with udai are particularly stressful also, he has always been such an easy child, i am finding it hard to deal with the new-found rebellion! Yeah, I see a lot of people around me uncomfortable with disagreements or confrontation (never thought you as one of them – we have had our share of disagreements and its never degenerated into fights) – so either people just dont speak up, or when they are forced to, they become way to aggressive, or angry because they dont know that you can disagree without thinking that the other person hates you. I deal with a lot of disagreements and arguments from my child, as my parents did with me, and I think its healthy being able to tell each other that we dont agree. Its healthy to be able to know that you can tell this to your parents (from whom children seek the maximum approval) and they dont love you less for that. Its important in our later relationships also to understand that its okay to disagree and the world does not tumble down. I believe in communication, however difficult they may be, as opposed to ‘keeping the peace’ – a much eulogised virtue amongst Indians. Its important to train children to voice difficult thoughts and not fear disapproval. To be able to break out from being ‘nice’. Ha ha! Udai will give me far more grief than Aadyaa I think. He finds it harder to express, bottles up his feelings and is way too sensitive. We have had our share of issues, teaches me a lot of patience! Aadyaa is headstrong and we will see how it goes. For now, she is a delight and easier to handle than before. I dislike confrontation. Always have. But my dad taught me to take the bill by its horns, so I have always made an effort to bring things out in the open. Have also fought to introduce the culture of communication in my married home. Quite the challenge! I like to think we are not too badly off! Love that we are having this conversation. Want to see you! Once the ” topic ” is discussed and throttled and debated, one can learn to converse normally again. I learnt this the hard way. A argument means some body has to win, a discussion does not have to be. I heard this somewhere – dont lecture the kid, give him questions. and he will come out with the answers and you can explain the impact with analogies – I learnt this the hard way. I am sure you have read the book – How to talk to teenagers and get you to hear them – something that sounds like that ? Good point! I guess it’s hard to be prepared when the transition from child to teen begins to happen. Will keep in mind the questions trick. And steel myself to ignore the sulking! Thanks for writing in! Thanks Sangita! Will keep in mind though Udai is so laid back, he may not bite the reverse psychology bit. Aadi is seven? How time flies! Well in this case homework was for him only and it was the first time they had so much. Hence the objections. Plus I had never come down on him about school work or anything ever before. Interesting experiences!